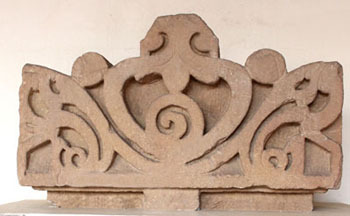 There are two verandahs on either side of the entrance of the museum, where many architectural pieces are exhibited like lintel, face stone, doorjamb, bas-relief, pediment etc. These beautifully carved pieces make one to wonder that all these together must have created masterpieces of majestic architectural buildings. In the North verandah, these pieces show wonderful carvings of fauna and flora, the Buddha in different postures, the Bodhisattvas, Hindu gods and goddesses like Shiva, Parvati, Ganesa, Vishnu and others. 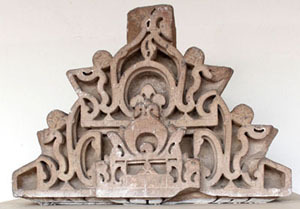 The verandah at the South side also exhibits face and corner stones, lintels, pediments, pedestals, gargoyle and other architectural pieces. 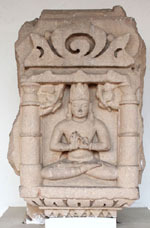 Among these a corner stone with two Kirtimukhas issuing pearls out of mouth are noteworthy. 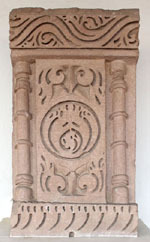 There are architectural pieces, which depict social scenes also. 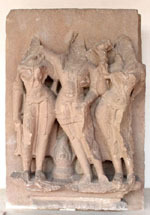 One of these shows three attendants, a female holding a child on her thigh and other male-female figures. 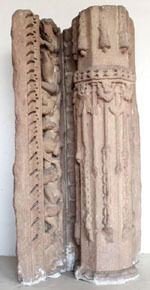 One lintel illustrates the ksantivadina jataka which narrates the story of the Buddha’s pervious life when he was tortured to death by a cruel king named Kalabu of Benaras. Medieval, c. 9 - 10th cent. A.D. Medieval, c. 10th cent. A.D.
Late Medieval, c. 12th cent. A.D.
Late Medieval, c. 11th cent. 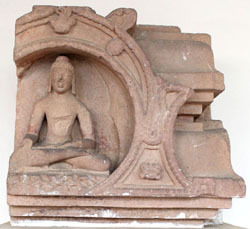 A.D.
Late Gupta, c. 7th cent. A.D.